The Cansiglio Botanic Garden: Beautiful Alpines in a Natural Setting. A visit to Cansiglio would not be complete without spending some time in the Cansiglio Botanic Garden – a beautiful creation right in the middle of this wide karstic plateau ('Piana del Cansiglio' in Italian). 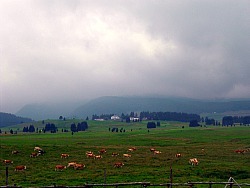 In fact, the presence of this garden has to be put in the more general context of the geography and landscape of the Cansiglio area (see below an image of the central plateau, near the Botanic Garden). This particular garden is somehow the counterpart of another important Alpine Botanic Garden, located nearby at Monte Faverghera (not far from Belluno). Situated in the middle of a karstic plateau, which is in itself an area of outstanding beauty well worth a visit, the Cansiglio Botanical Garden contains a good selection of the plants that can be found in the Eastern (or Oriental) Alps, but it is quite different in nature from Monte Faverghera, as it lies – despite its altitude – in a predominantly flat area. The Garden was founded in 1972 by botanist Giangio Lorenzoni together with forestry inspector Giovanni Zanardo and the collaboration of the University of Padua, but it has officially opened to the public only as late as 1995. 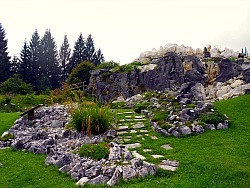 Despite its young age, though, it looks already well established – a clear result of the fact that the site is lovingly tended (below, an image of the rock garden). The Cansiglio Botanic Garden contains over 700 plant species that are typical of this sector of the Pre-Alps; amongst them, the highlight is probably the Silver Cranesbill (Geranium argenteum), which is also the emblem of the garden. 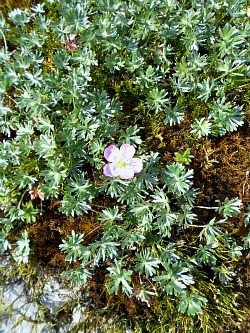 This tiny, beautiful pink flower can be found growing in nature on the slopes of nearby Monte Cavallo (2,251 m) and along the path that leads to Rifugio Semenza (2,020 m; see Alpago for a description of the walk) – but if you don’t feel like venturing on the trek, then you can admire its blossoms here (see picture below). 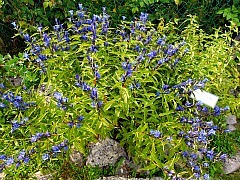 There is also a good selection of plants growing on dry habitats, including spectacular specimens of Eryngium and Campanula (Bellflower), as well as a more quintessentially Alpine flora, with species belonging to such genera as Gentiana, Sedum, Minuartia, Saxifraga and many other – grouped here by habitat (pictured in the gallery below, in order, Campanula rotundifolia; Gentiana asclepiadea and Minuartia chledroides – all plants belonging to typically ‘Alpine’ genera). 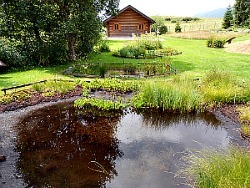 The Garden also hosts an interesting wetland area (with a pool known locally as 'lama') – and in that respect, perhaps, its most notable feature is the presence of a fossil of a larch trunk which dates back 4,000 years ago. This trunk can still be admired today, immersed in the peat bog that has allowed its very preservation (see below an image of the peat-bog containing the fossil larch)! The presence of these small pools, as well as of other caves within the perimeter of the garden, is also a reminder of the karstic nature of the terrain in the area (see below another image of the wetland area – containing also the two peat-bogs – situated near the entrance). As well as a place where to admire the beauty of the Alpine flora, a very good labeling and sign system makes the Cansiglio Botanic Garden also a perfect facility for educational purposes, even though – it has to be said – most of the reading material is only in Italian (you can help yourself, though, with the aid of a page that I have devised specifically to assist you with the visit, dedicated to the Alpine flora of Cansiglio). In the vicinity of the gardens there is also a small Natural History Museum, dedicated to the memory G. Zanardo too, which hosts a collection of stuffed animals (this may not be to everyone's liking! ), fossils and extensive explanations on the nature of local karstic phenomena, illustrated with drawings and pictures. The gardens are managed today by the Italian Forestry Commission through “Veneto Agricoltura”, and are open seasonally from June to September. If you have been insipired by what you've read and seen so far, you can also read a more extended version, with a description of the visit route (as anticipated above) and a detailed explanation of what is contained within the garden, or a more general description of the natural setting in which the Cansiglio Botanic Garden is situated. Even though it has no direct connection with the Botanical Garden, there is – in the Cansiglio – also an interesting trail dedicated to the forest habitats, and the way in which forests can assist in mitigating the effects of climate change. Albeit brief, and not so easy to find, this trail provides nevertheless an opportunity to learn more on a very important topic, and within an atmospheric woodland setting. More detailed information, together with a detailed description of the LIFE+ManFor trail, can be seen on a dedicated page, Cansiglio LIFE Project.